Marc Von Em is a soulfully energized singer/songwriter whose sound flows easily between folk, blues and funk. 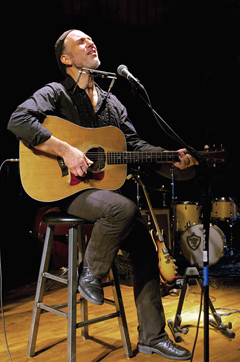 Driven by his fluid acoustic guitar playing, rich powerful voice, and comfortable stage presence, Marc's live shows never fail to excite audiences. Marc began his solo career in 1999 when he self-produced and released his first solo CD, "Von Em." He has since released three more recordings, the most recent entitled "Crash Boom Pow". Marc's belief is that an artist not be limited to one genre, and his collection of original songs are a testament to that, running the gamut from solo acoustic finger-picking to full band funk. Along with his independent music, Marc also performs as a back-up vocalist and guitarist for Rob Thomas (Matchbox 20), finishing his third world tour with Rob at the end of 2016. Marc is signed to Pure Pop Music, a music publishing company representing writers in various genres of popular music. Since joining Pure Pop, Marc has been spending time in Nashville writing songs with some of Music City's best writers.